The Colorado Bulldog is an older drink. I'm not quite sure where the name came from, and I've never actually had one, but I hear they're delicious. 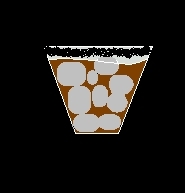 To make a Colorado Bulldog, just combine 1.5 oz of vodka, 1.5 oz of Kahlua and .5 oz of cream in a rocks glass filled with ice. Then, top it off with cola. Well, enjoy your drink.